The use case shows how to automatically fix a design in partial mode. When design is large, it's time consuming to run ECO from the most top level and it may bring redundant fixes. If all RTL changes are contained in one sub-module and its hierarchical instances, the top level module can be set to the sub-module, and run 'fix_design' on that sub-module. If design is large and ECO run time becomes too long, there is potentially a way to improve the speed. 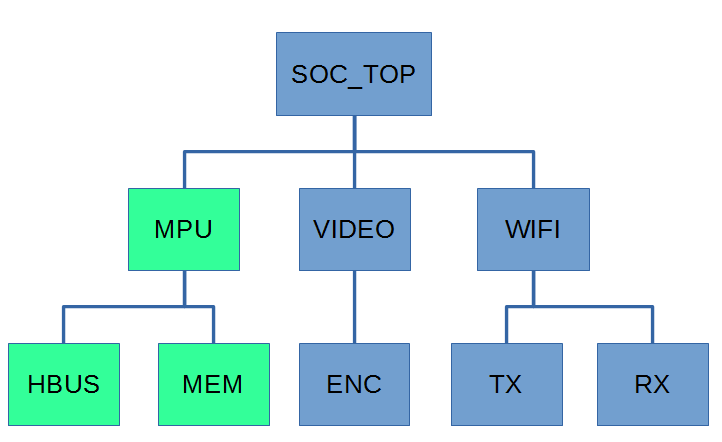 For a design shown in the following chart, if RTL changes are known to be contained inside module 'MPU' and its sub-modules, 'HBUS' and 'MEM', the top level can be set on 'MPU' and 'fix_design' can run much faster. The example is in the released package.